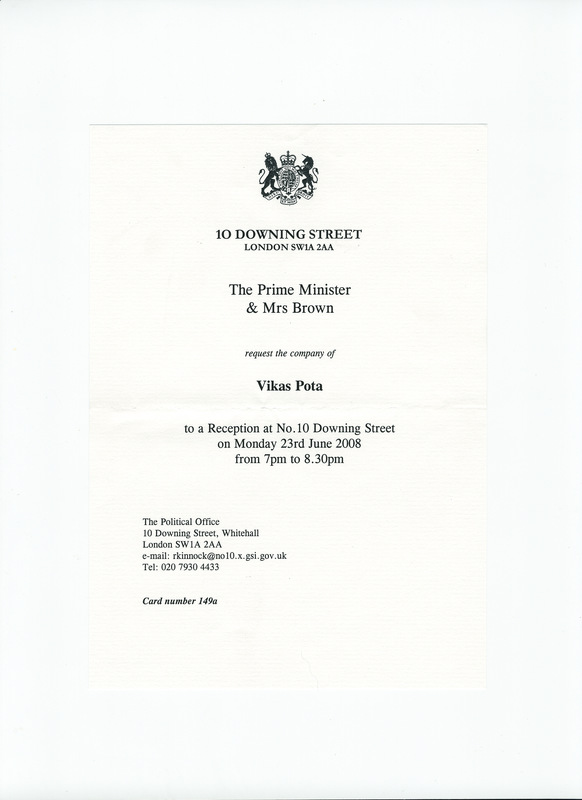 It was an honour to be invited by the Prime Minister and Mrs Brown to a reception at Downing St for entrepreneurs a few days back. The reception coincided with the launch of a new strategy for enterprise and a set of counterproposals by the Conservatives. From my experience of starting businesses in the UK and in India, I have to say that the UK is way ahead and easier to navigate for the budding entrepreneur. We’re always going to have issues, and we’re always going to feel that the Government isn’t doing as much as it can to reduce red tape. However, if one takes an objective look (at our bottom line), our businesses are growing. In conversation with the PM, many of us expressed that we faced the real danger of talking ourselves into a recession. Despite the negative media that the economy is receiving, the overwhelming consensus was that our businesses were growing, orders and contracts were being sealed and in general terms, we were all confident of weathering any economic downturn that we may face. However, what I found very interesting was that everyone I spoke with at the reception said that they already had some kind of relationship with a high growth economy like India or China. Whether it was the lady who specialises in glass architecture, or the guy from Wales who’s set up an incubator for hi-tech companies in Wales. Over the past few weeks, I’ve been fascinated by the way different systems and cultures deal with disasters and crisis situations. Take the Chinese earthquake as an example. Their departure from their “normal” mode of behaviour i.e. closing down any access to politicians, access to western media, providing statistics on the death toll etc has to be welcomed. I think Premier Wen Jiabao has shown that the Chinese, too, are normal human beings and not the robots who work 24/7 without any signs of emotion to provide us our DVD players and Gap jeans. Everyone goes on and on about China, but, I for one, have simply not caught the bug to visit the country. I suppose my reasoning is that it simply doesn’t feel like a fun place to go to. Sure, it may have history, sure indigenous culture is important to note, but the overarching rules that dictate daily life that are laid out by the Communist Party of China (as portrayed in our media) seem a little too strait-jacketed for me and for this reason any effort made by Premier Wen to bring in more openness in China has to be welcomed. Perhaps the Burmese should take note?